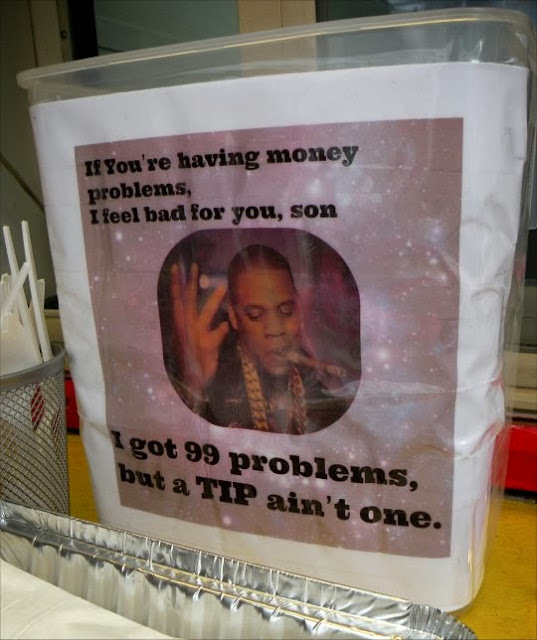 The food carts at 10th & Alder are getting a little more varied. A few places have gone out of business and new genres of food are taking their place. The new kid on the block is Sabrosa Barbosa. 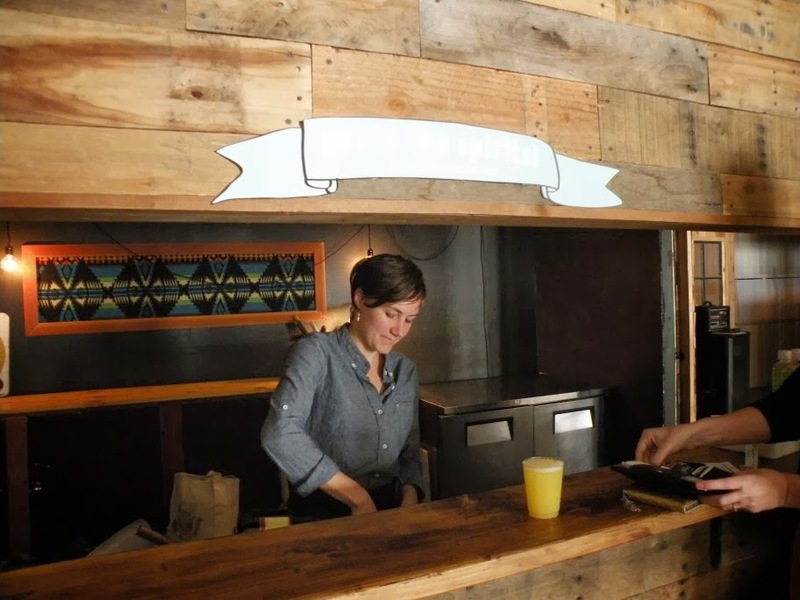 Everything at the cart is gluten free, and they even offer vegan and vegetarian versions. When I saw their shiny red new food cart I knew I had to give them a try. I cam back the next day and their A-board sign definitely helped draw my attention in. Now, on to the important part - the food! 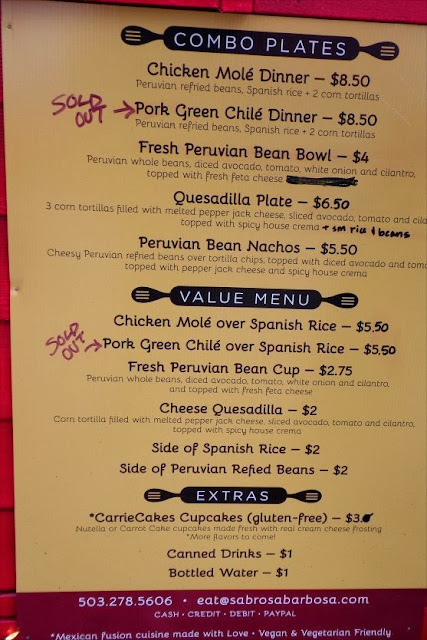 In the 24 hours between when I took a photo of the outside of the cart, and came back to try out their food, their prices increased by .50 cents. Not a huge deal, but I was pretty stoked on a $5.00 lunch option. It looks unexceptional, but it was actually very, very good. The chicken mole is INCREDIBLY spicy - but also incredibly delicious. I love spicy foods, but had to take breaks while eating this. The chicken mole was set atop a very small layer of rice, which was nice and meant that the bowl was mostly meat. 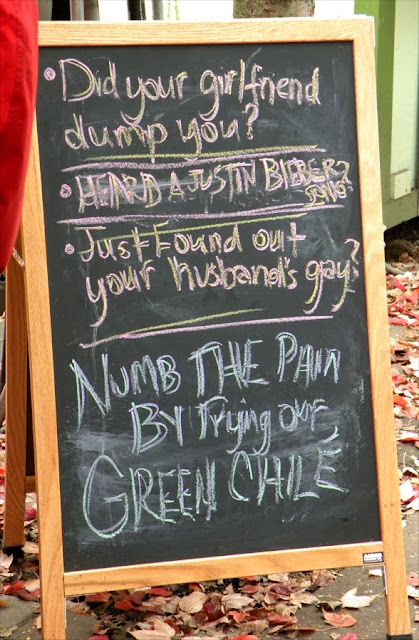 I'll definitely be returning to try the quesadillas and Pork Green Chile. If you'd like to check out Sabrosa Barbosa for yourself, their cart is located at the food cart pod at 10th Avenue and Alder Street in Portland, facing Alder street, directly across from City Target. After continually being disappointed with Birchbox, I cancelled and signed up for Ipsy. I am SUPER pleased with my very first Ipsy Glam Bag. 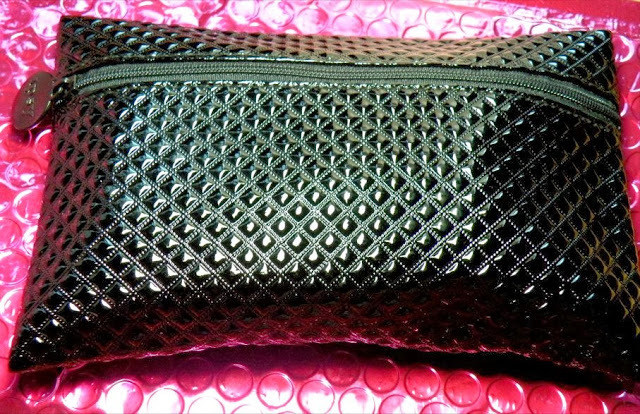 Every month the Ipsy Glam Bag arrives in an Ipsy makeup bag - this is GREAT for me, as I tend to destroy makeup bags in record time. Now I'll be able to swap them out as needed. I really liked the makeup bag this month - and it's lined in red, very pretty! Mirabella Eye Blender eye shadow brush (FULL SIZE!). WOW this brush is great. I've never bought a blender brush, the ones I have are from smaller travel size brush sets, it's nice to have a full sized blender now. 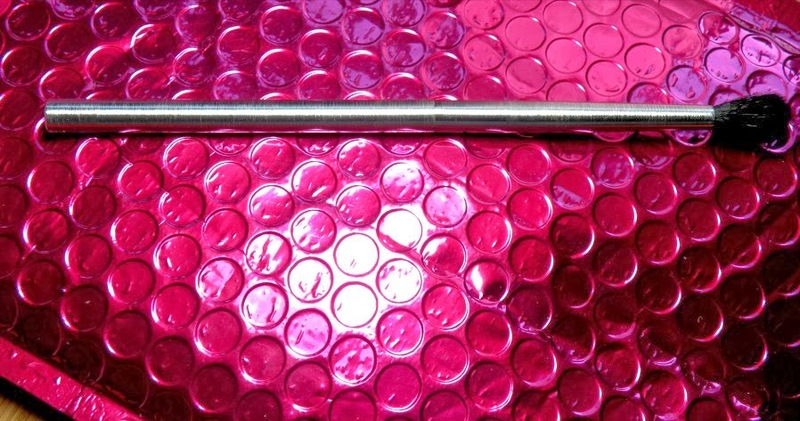 The brush has a stainless steel handle and it's a great weight when in your hand. Salon Perfect Perfectly Natural lashes #53 (FULL SIZE!). 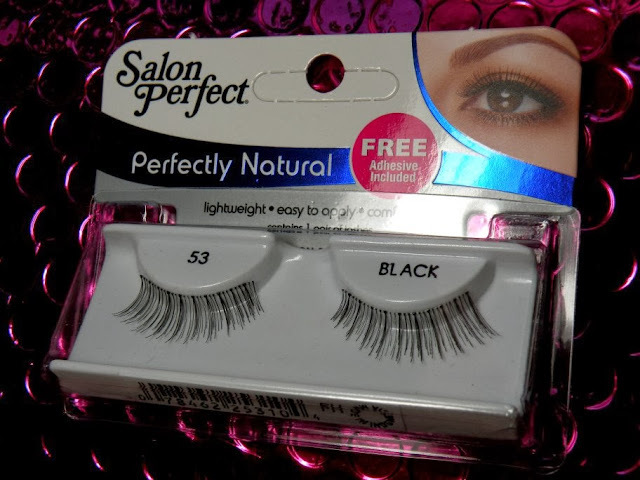 Salon Perfect brand is apparently exclusive to Wal-Mart. These lashes actually look really nice and I'm surprised that they are so inexpensive. Pop Beauty Bright Up Your Life eye shadow trio in "Smokin Hot" - This is the teaser version of the 10 pan Bright Up Your Life palette - but good news for me, these are the colors from the 10 pan palette that I liked the most! 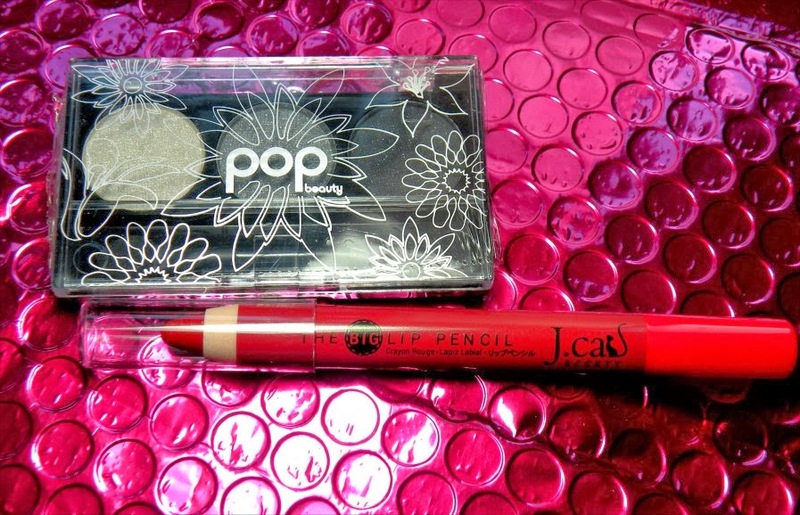 J Cat Beauty Big Lip Pencil in Red Rose (FULL SIZE!). It seems to be a cross between a lipstick and a lip liner. I don't wear lipstick, ever - and red is WAY out of my comfort zone (I wore red lipstick to my company's Gatsby themed Holiday party this year and felt totally out of place - and found it really difficult to keep it on all night). I have a friend who looks amazing in red lipstick, so I'll be gifting this to her. 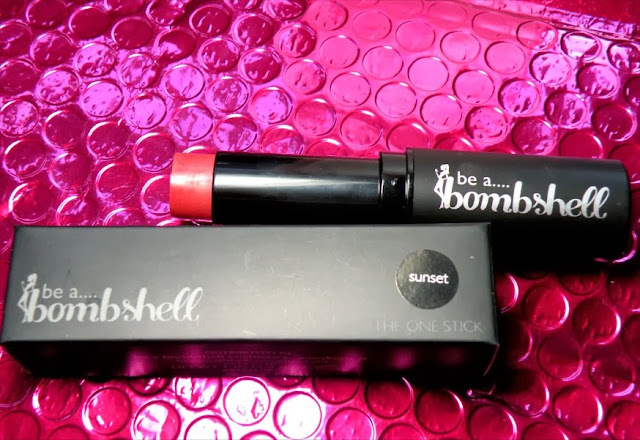 Be a Bombshell the One Stick in Sunset (FULL SIZE!). So this, as the name suggests, is a 3-in-1 product (blush, shadow, lip). I would look like death warmed over with this color on my eyelids, but I'll definitely be tossing it in my purse to use when I need a little color on the go. Final verdict? Ipsy Glam Bag is a HUGE hit! I paid $10 for my Glam Bag and it had a total value of $57.17 (not counting the makeup bag, that I would easily have paid $5 for). 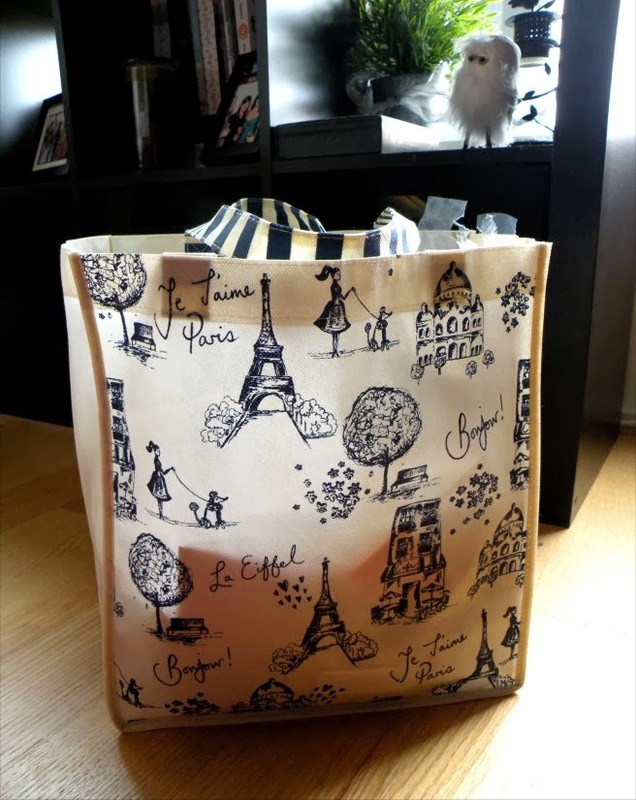 My January bag can't get here soon enough. If you'd like to sign up for Ipsy, you can do so through my link here. Whew - it's been such a busy month I never thought I was going to have a moment to sit down and write this review! This months Mystery Beauty Box was curated by Lisa Hoffman of Lisa Hoffman Beauty. Lisa Hoffman Beauty seems to focus mainly on "Fragrance Jewelry", necklaces, bracelets and earrings that you insert "fragrance beads" into to release scent throughout the day. She doesn't offer any actual "beauty" products, just fragrance and bath and body. 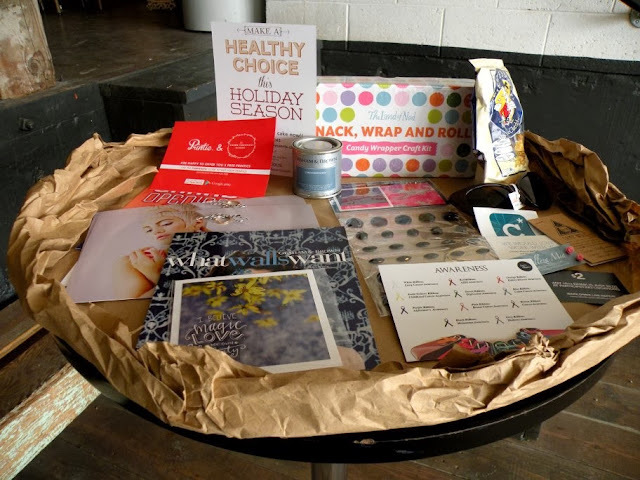 This definitely explains the lack of beauty products in this months box. Lisa Hoffman Beauty Madagascar Orchid Moisturizing Body Cleanse (FULL SIZE!) - I thought that Madagascar Orchid would smell exotic and amazing, I was disappointed - it smells like sunscreen. I'll definitely give this a try once I'm out of my current body wash, I hope that when used the smell is a little more orchid rather than Coppertone. DHC Mild Lotion sample - Interesting, I have received this as a sample before and always thought it was a moisturizer because it is called mild "lotion". This time I looked it up on the DHC website (www.DHCcare.com) and it is actually a "revitalizing tonic to help your moisturizer go the extra mile in keeping your skin freshly hydrated. It’s alcohol-free for gentleness, and blended with soothing cucumber juice to keep things cool.". I'm kind of excited to try this now BEFORE my moisturizer, it gets great reviews. 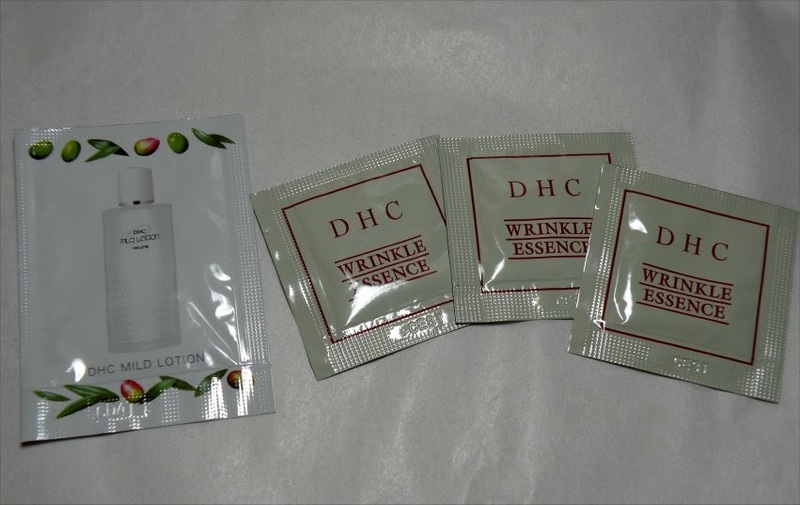 DHC Wrinkle Essence samples (x3) - This Wrinkle Essence is so expensive that each of the .06oz packets have a value of $2.10. It's definitely the kind of product that I would need to really test out before purchasing, so I appreciate that they included three packets. I kind of hope I hate it, because at $47.00 for just over a half an ounce it is very, very spendy. Sultra 14 inch clip in hair extension in Lapis Blue - So normally I would have opened my box, seen something like this, and laughed, because I am not the type to have bright blue streaks in my hair. But it just so happens that the day after I received my box I was planning on wearing a black sweater with a bright blue detail on the back, so I clipped this sucker into my hair, curled it with my hair, and wore it instead of jewelry. It was great quality (held up to being curled with a flat iron on high heat). 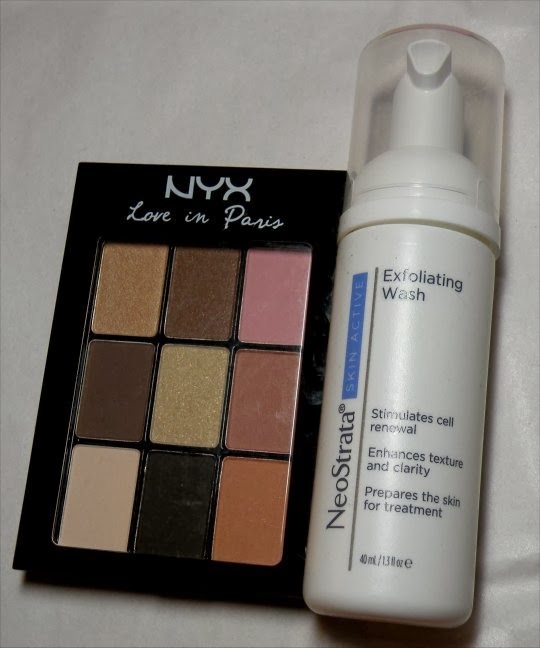 NYX Cosmetics Love in Paris palette in Madelines and Macaroons (FULL SIZE!). Meh.. I don't wear neutrals, they make me look ill. This will get gifted to one of the ladies at work. NeoStrata Exfoliating Wash - I feel like I get some form of face wash in every Beauty Box. Maybe I don't use enough product when I wash my face, because I have a zillion I've yet to try (I use one up completely before moving on the the next). This one gets great reviews, so once I get around to trying it I'm sure it will be a hit. 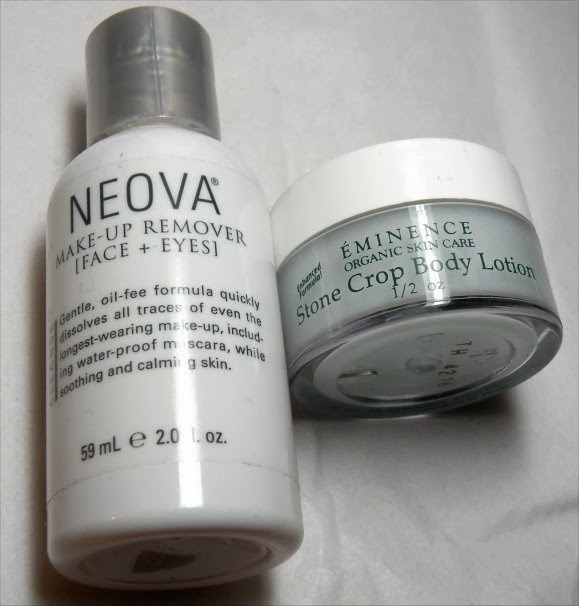 Neova Make-up remover Face + Eyes - I kind of hate that this product is oil-free, I LOVE using cleansing oils for removing makeup. I'll give it a try though because I do like that it claims to "dissolve all traces of even the longest-wearing makeup". I have a couple of waterproof mascaras that seem impossible to remove. Eminence Organic Skin Care Stone Crop Body Lotion - Eminence products are made in Hungary and are all organic. This claims to be a lightening body lotion for sensitive skin. I find the smell to be overwhelming and the lotion to be sticky (and I actually feel drier after applying). I'll throw this into my desk at work in case I'm ever desperate, but it is not something I would purchase. 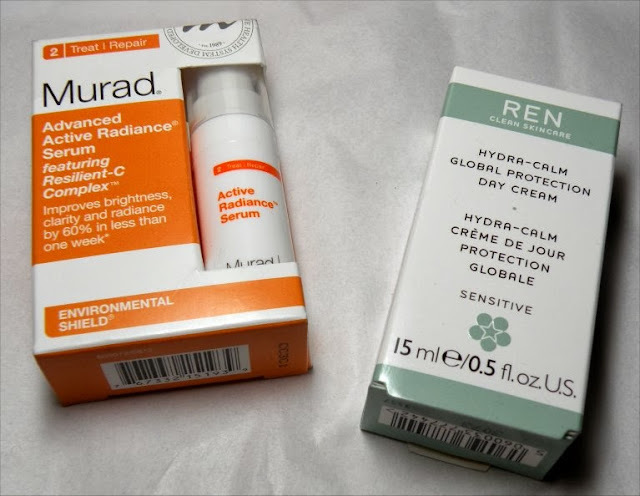 Murad Advanced Active Radiance Serum - This is $89 an ounce for the full size version so I appreciate the generous sample. I never seem to see a difference when a products touts itself as improving "brightness", so I'll be interested to see if this pricey serum gives me some results. REN Clean Skincare Hydra-Calm Global Protection Day Cream - This moisturizer is formulated to leave sensitive skin optimally hydrated, calmed, soothed, protected and looking beautiful. I can't wait to try it. 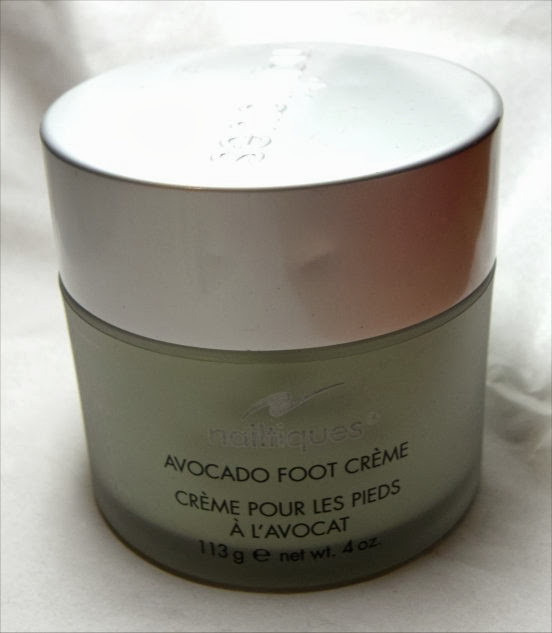 Nailtiques Avocado Foot Creme (FULL SIZE!). I've received some form of foot cream every month for the last three months in beauty boxes, so it will be a while before I give this a try. It gets great reviews, and the packaging is lovely (I really like the frosted glass jar and brushed nickle lid). If you're thinking about signing up for the Blush Beauty Box but are still on the fence and would like a $10.00 coupon off of a recurring subscription box (boxes are $35 for a one time order, or $24 with a recurring subscription - you can cancel at any time) - shoot me an email at kathryna at gmail.com and I'll send you a coupon code. This month's box contained a value of $120.73, almost five times what I paid for it - so I'm pleased. I'm curious to see what January's box will bring. 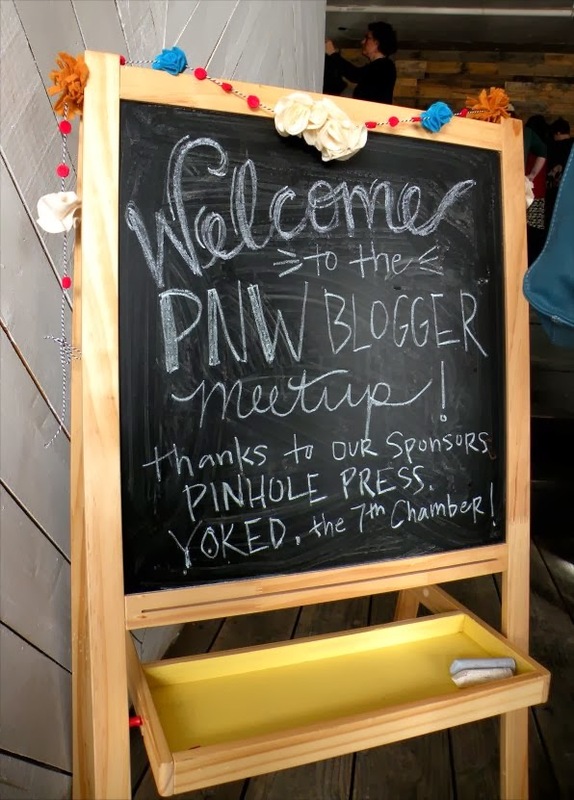 A couple of weeks ago I had the privilege of attending the 2013 PNW Blogger Holiday party. 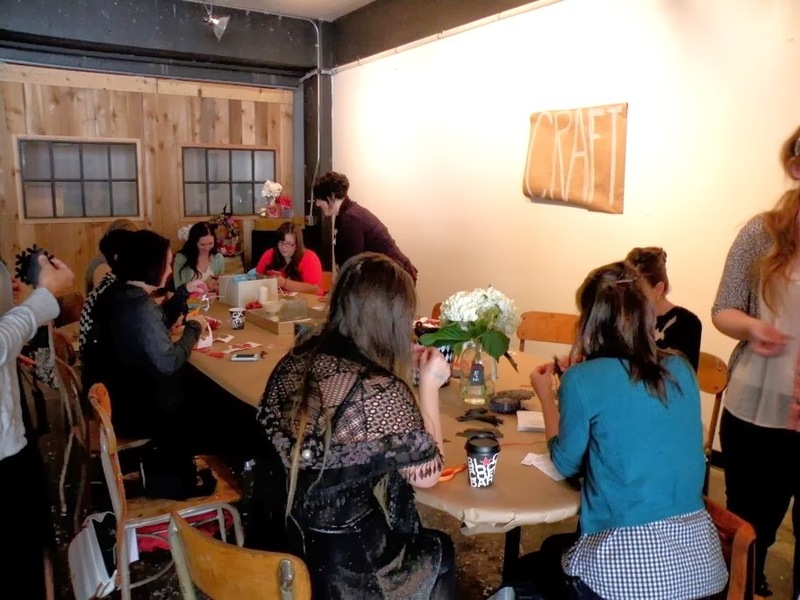 A great time was had by all, brunching, crafting and catching up/meeting each other. 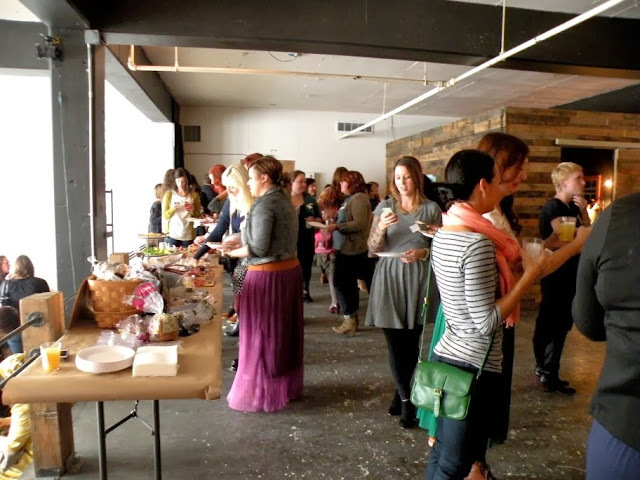 The event was held at Union/Pine at 525 SE Pine St in Portland. 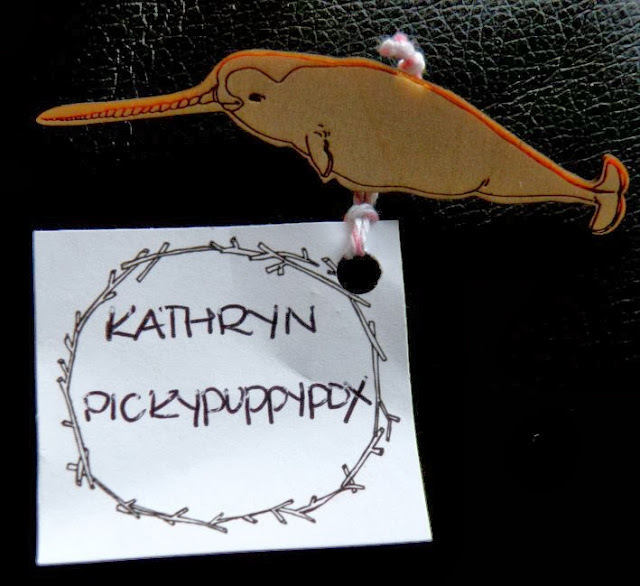 Adorable narwhal, corgi and antler name tags were provided by The Paper Mama. 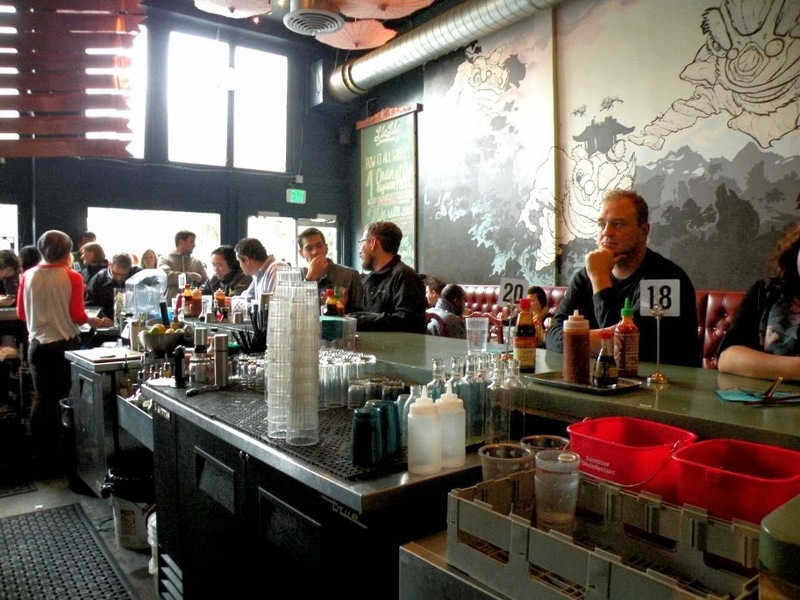 Because this is Portland, and Oregonians seem to serve alcohol with every meal, there was a bartender on hand provided by The 7th Chamber, serving Mimosas and Bloody Marys. (definitely check out The 7th Chamber, they specialize in "charming the pants off of the Internet"). 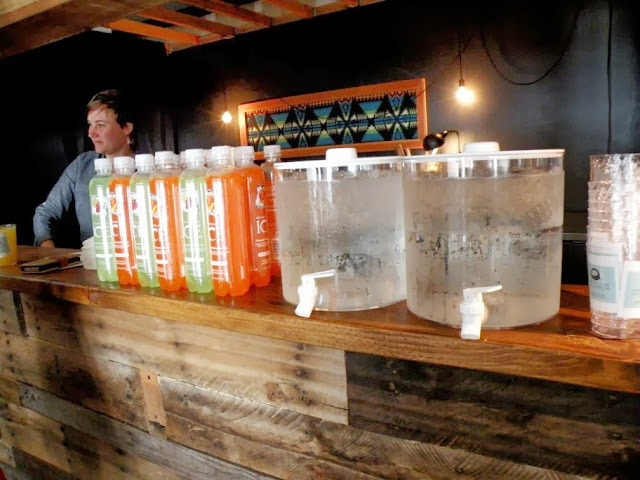 There was also refreshing ice water, and Sparkling Ice Beverages, provided by Sparkling Ice. A fabulous brunch was provided by a plethora of companies, there were bagels and gluten free breads from Franz Bakery, coffee from Black Rock Coffee, dessert bars from Rawdacious Desserts, and then of course the best part..
Charcuterie plate! 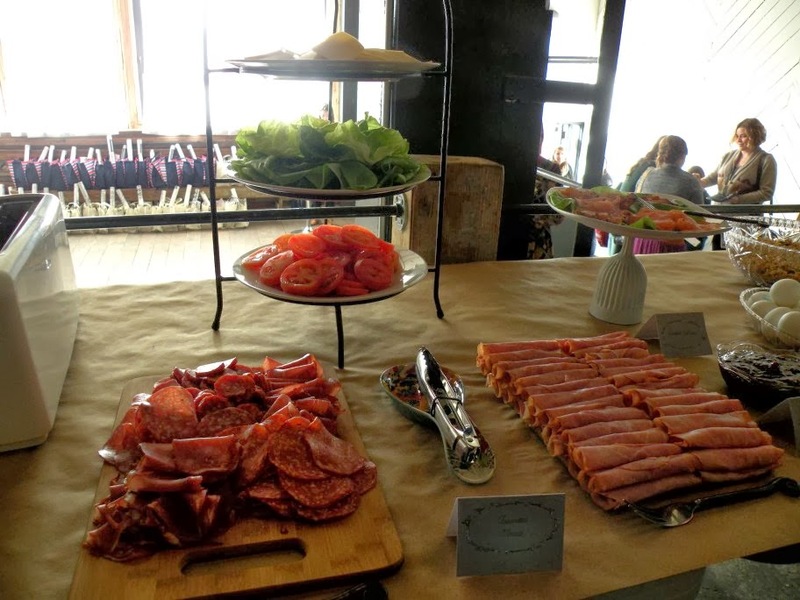 A plethora of meats, cheeses, even multiple varieties of lox up on that little stand. You know you're brunching in Portland when there's a pile of pork on the table. 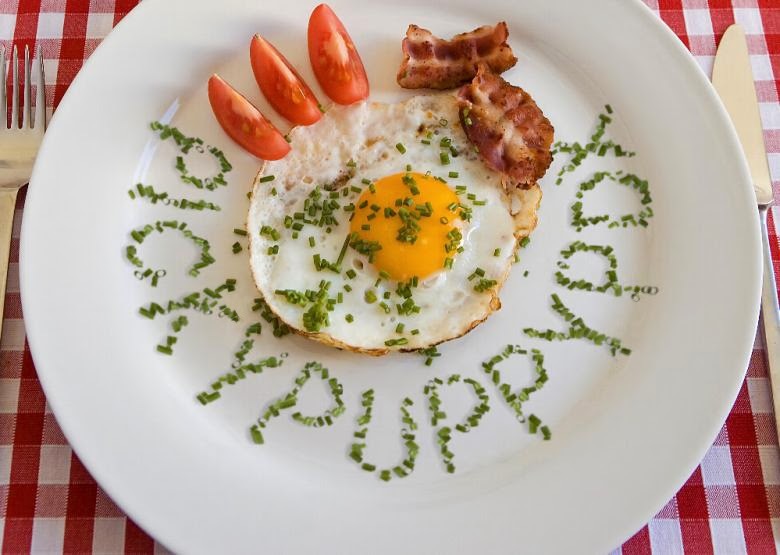 Everyone getting their brunch on. 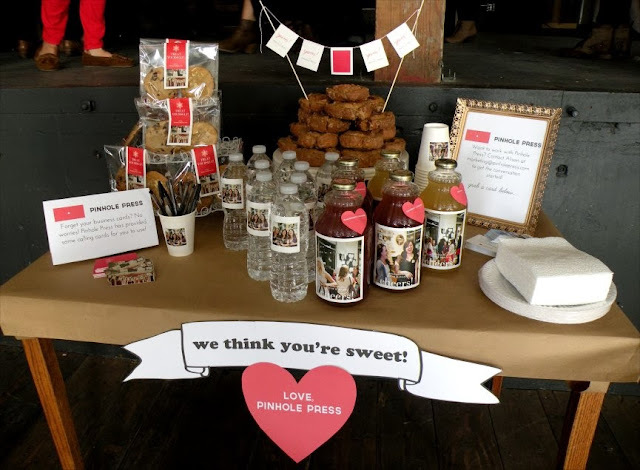 Pinhole Press provided a dessert bar, with donuts, cookies, lemonades and bottled waters. There were two different craft projects that could be attempted (I say attempted because I am NOT crafty and rage quit while attempting the first craft). 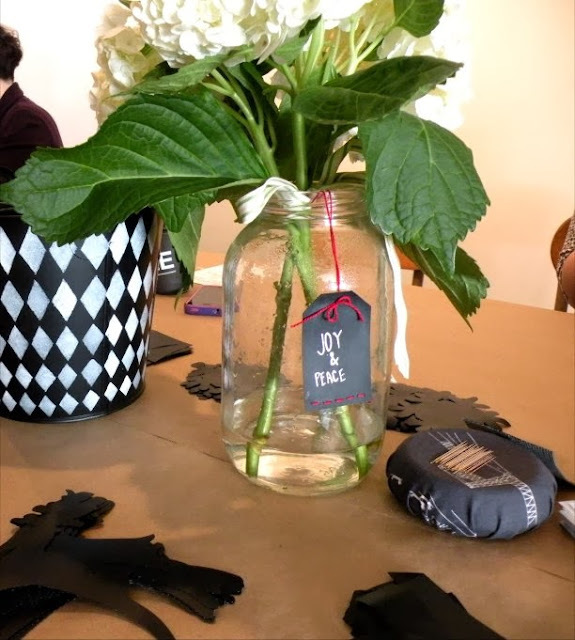 Fabric Depot presented this deceptively difficult craft of gift tags made out of chalkboard paper, decorated with embroidery thread. I gave up after a couple of minutes when I couldn't get the fat embroidery thread through the tiny head of the needle. I'll stick to store bought tags. I do not have the patience/craft expertise for this. 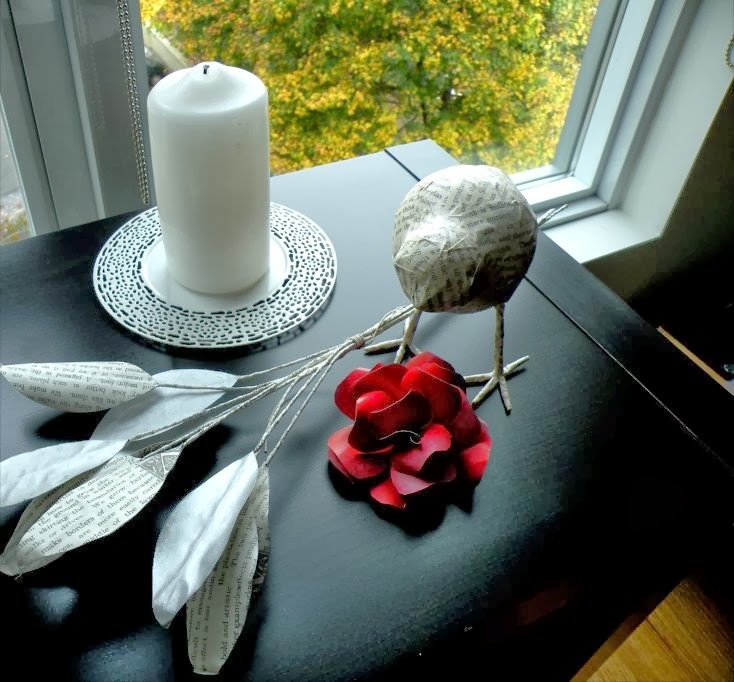 The incredibly patient Lia Griffith brought us this paper flower craft. 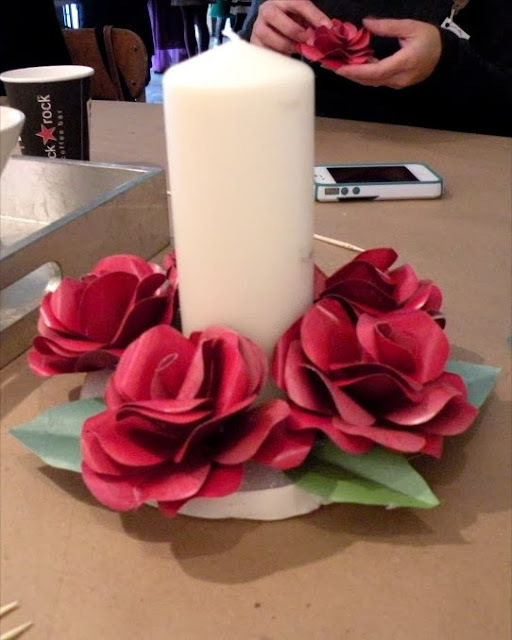 It was simple (just cut out the petals, curl them around a pair of scissors, and glue them together. I brought my paper flower home, and it goes nicely with my paper bird and paper leaves I already have. (these were not DIY - they are from West Elm). After a few hours of chatting and catching up with the lovely bloggers of the PNW, there was a drawing for some fabulous prizes (a Microsoft tablet, a year of bread from Grand Central Bakery, and many other things). 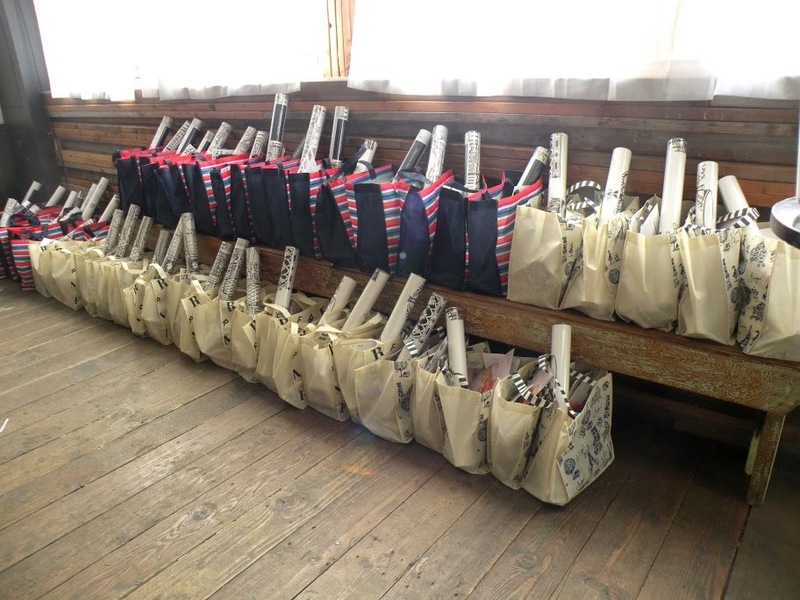 We departed with a goodie bag full of mostly craft related swag, generously donated by many sponsors. 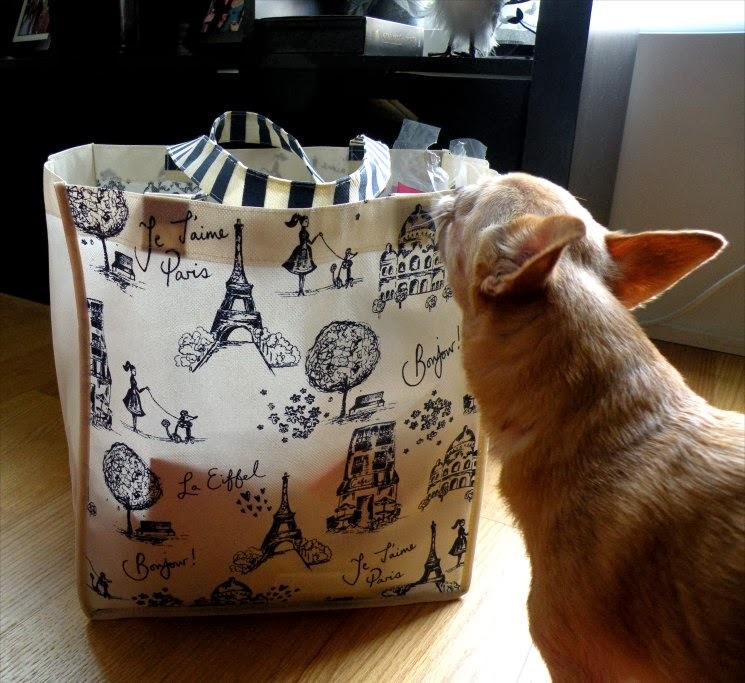 Hailey checking out my bag. She was pretty certain that I brought it home for her. In fact, she had a couple favorites out of the bag. 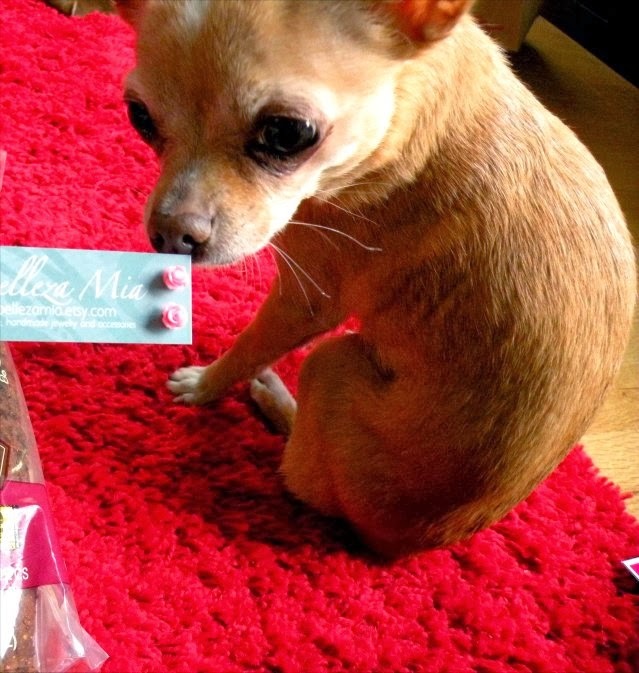 Hailey really wanted these earrings from Belleza Mia. But alas, her ears are not pierced (come on, I like my dog, but I'm not a crazy dog lady who pierces her dogs ears and tattoos eyebrows onto the dog). I brought these to my office, figuring that someones daughter would love them. 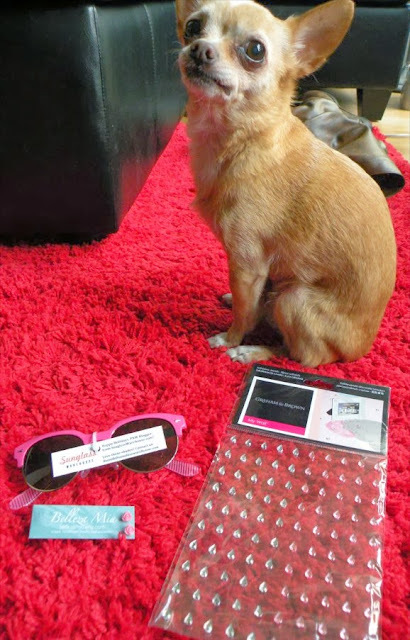 Hailey posing again with the earrings, as well as a pair of sunglasses from Sunglass Warehouse and some rhinestone embellishment stickers from Graham & Brown. I had a great time meeting local bloggers, when you're done here, why don't you check some of them out? How can you not love Luc Lac Vietnamese Kitchen? They describe their establishment as, "We are just one big, pho sling’n, fish sauce cookin', cocktail pourin', Portland lovin' family." I LOVE THAT. Even if the food was awful, it would be worth checking them out just for that description alone. Fortunately for everyone, the food is exceptional, they're open super late, and they are convenient from anywhere in downtown Portland. I arrived at Luc Lac at noon, so right at the height of the lunch rush. Upon arrival I joined the line and tried to decide what I would order. 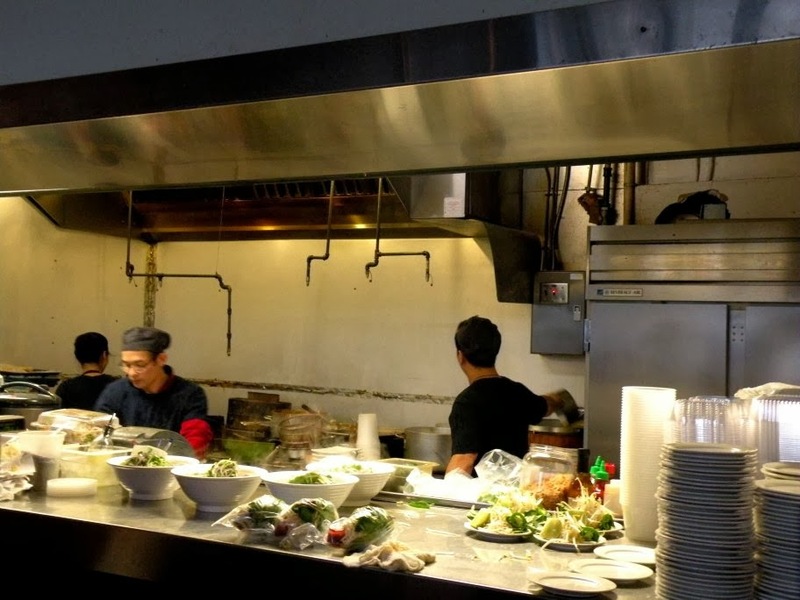 Luc Lac is a counter service restaurant (like my two faves Lardo and Grassa). 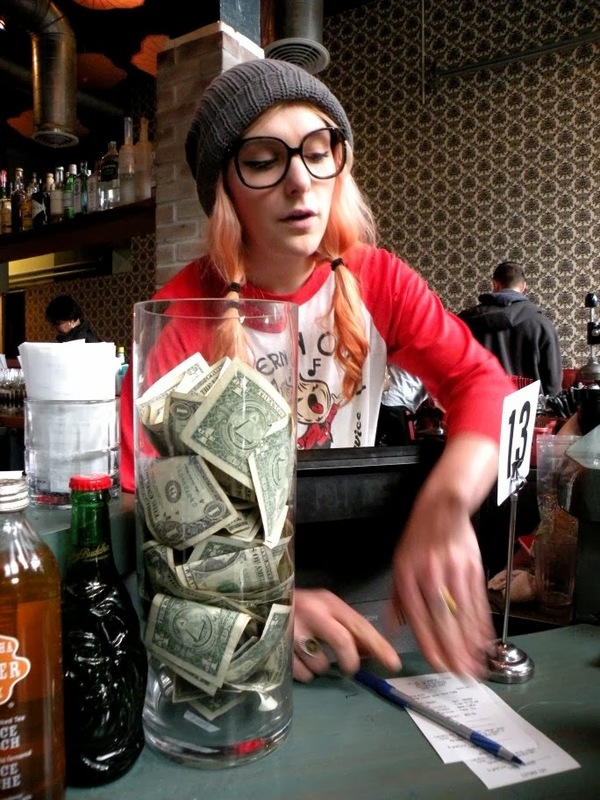 This is definitely a trend that's on the rise in Portland, and honestly, I don't mind it at all. 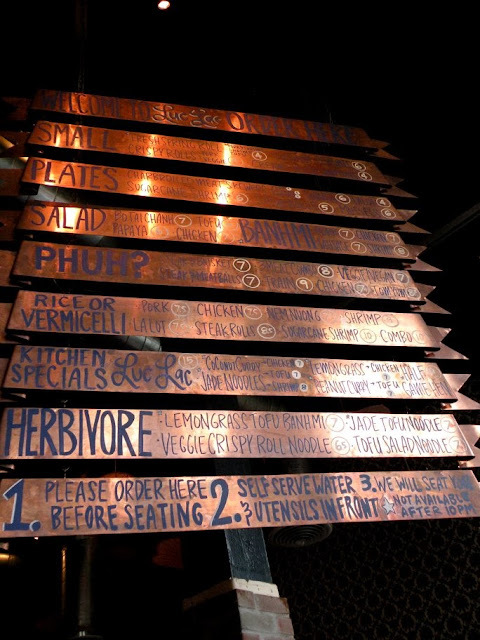 When you get up to the counter, you're met with a towering copper menu of delicious options (they also have smaller paper menus for patrons who don't wish to crane their necks toward the ceiling in order to decide what to get). Once you've ordered and paid, the ever-so-Portland waitstaff will explain that it is now time to take your number and go wait on the other side of the counter for a table to be ready (they seat you in the order that you've ordered - which is genius, as by the time you're seated your food is that much closer to being ready. There are all kinds of things to do while waiting for your table. People watching is always an interesting option. 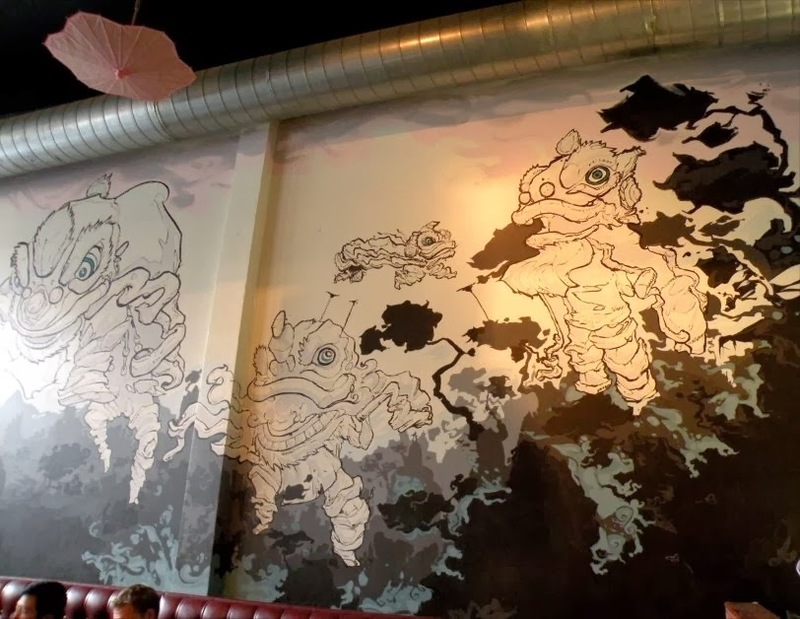 As is taking in the artwork..
Once our table was ready I sat down to my delicious iced Vietnamese coffee ($4.00). 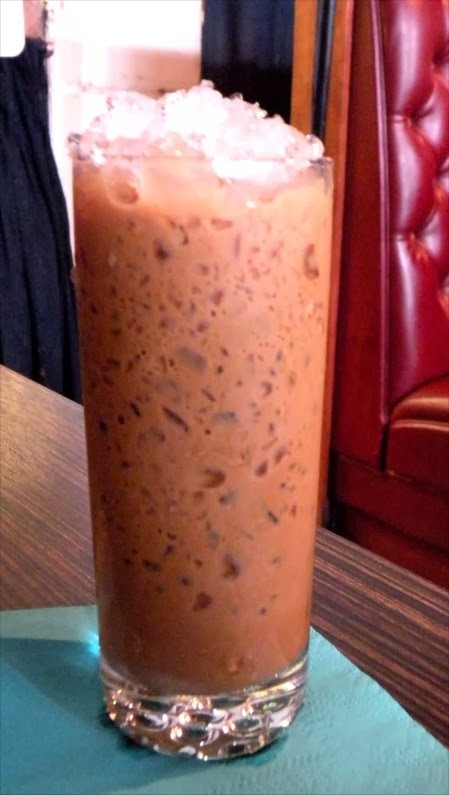 Courier Coffee with condensed milk and crushed ice. It was very good, but so full of ice that it was gone in just two sips. 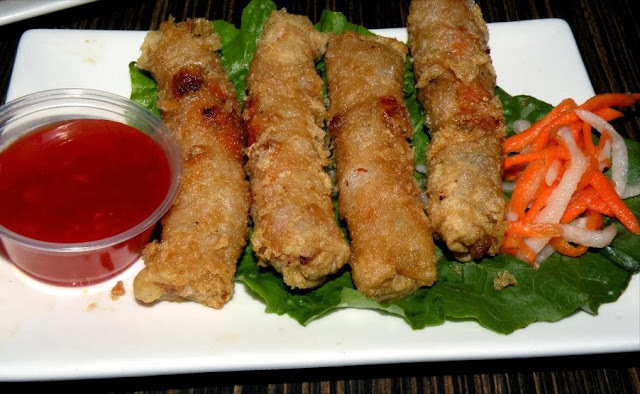 We started with Pork Crispy Rolls ($4.00). They don't look like much, but they were very good. Crispy and light, served with a spicy dipping sauce. T got the Grilled Chicken Rice Plate ($7.50). THREE honey glazed chicken breasts on about a weeks worth of rice, with two pork crispy rolls, spicy dipping sauce and delicious cucumber and tomato garnish. This was enough food for at least three meals. 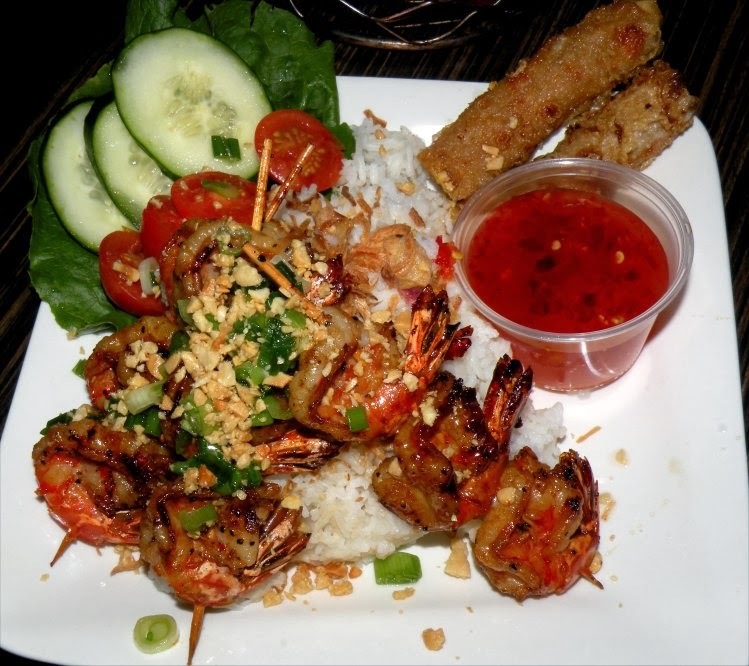 I got the Grilled Shrimp Skewers Rice Plate ($9.00). SO MANY SHRIMP! I was expecting a skewer with maybe four shrimp. This was three skewers of three shrimp each - large, wonderful shrimp, covered in garlic and sesame oil, doused with peanuts and scallions. Again, served with two pork crispy rolls and a plate of rice the size of my head. 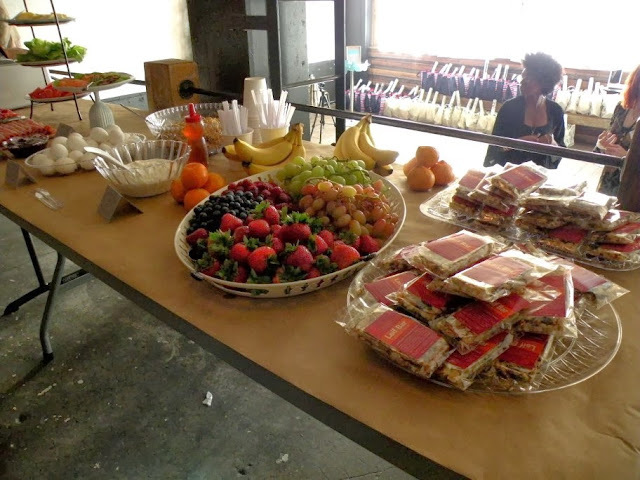 We really enjoyed everything we had - and the food that the people around us were eating all looked great too. Just be prepared to have leftovers for days after eating here. 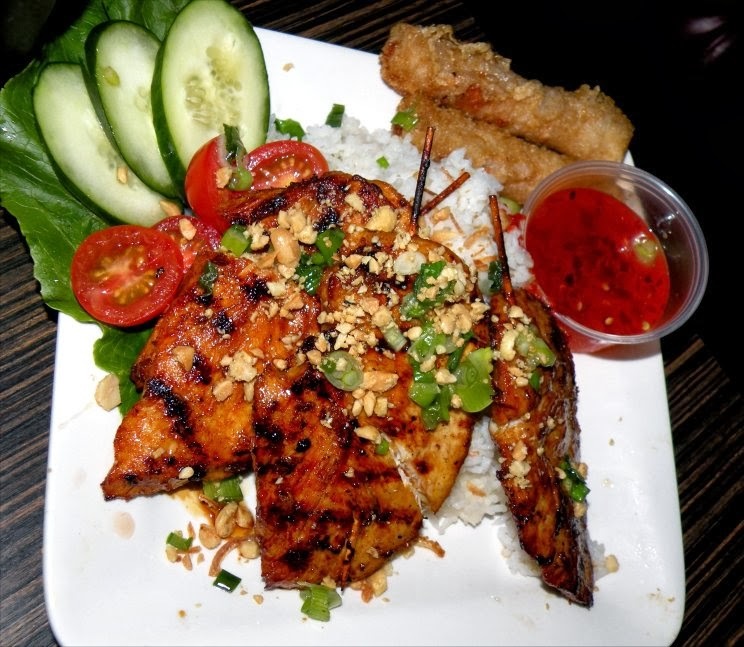 If you'd like to check out Luc Lac Vietnamese Kitchen for yourself their website is www.luclackitchen.com. They are located at 835 SW 2nd Ave in Portland. They are open for lunch Monday - Friday from 11:00am - 2:30pm. Happy Hour is Monday - Saturday from 4:00pm - 7:00pm. They serve dinner Monday - Thursday from 4:00pm - Midnight, Friday - Saturday from 4:00pm - 4:00am. 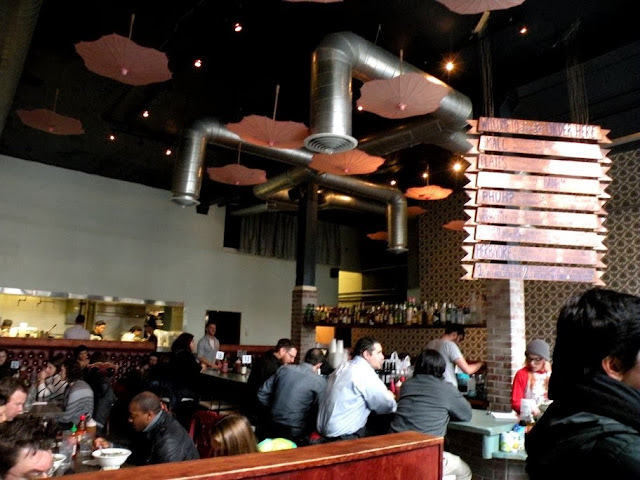 Luc Lac is closed on Sunday. 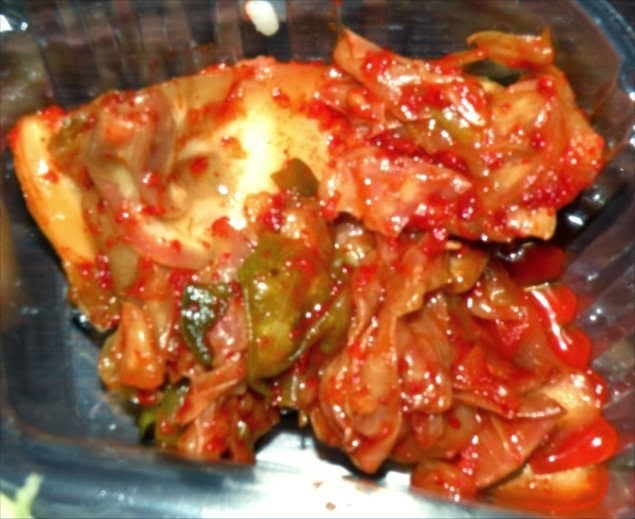 I'm huge fan of Korean food - I could eat Kimchi with every meal for the rest of my life and never get tired of it. I also quite enjoy Mexican food, so when I heard that there was a food cart by my office that was Korean Mexican fusion I knew I had to check it out. Meet my new love, Korean Twist. OH MY GOD. It's delicious. Seriously. Stop reading now and just go try it. I could probably eat lunch here everyday.. for... ever. But I think it might kill my blogging. But it almost doesn't matter, it's that good. I ordered the Three taco combo ($6.00). 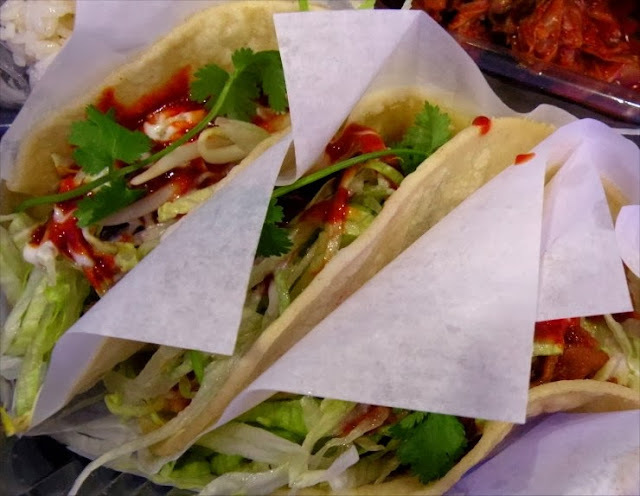 I chose Bulgogi, Spicy Pork and Chicken for my three tacos, and kimchi as my side (a side of rice is also included). This is a huge amount of food for $6.00 (although I could have easily done with double the kimchi - it was amazing). Blurry closeup of the kimchi in all its spicy glory. I think the sheer spiciness of the kimchi may have fogged up the camera lens. It was SO GOOD. If they sold their own Korean Twist kimchi I would totally buy it. And put it on grilled cheese sandwiches, toss it in salads, throw it into omelettes, stir it into fried ride, put it on ice cream (okay, I PROBABLY wouldn't eat it on ice cream - but Salt & Straw might make it a flavor one day - I'll take credit for it of course). Rice. The rice was really, really good. 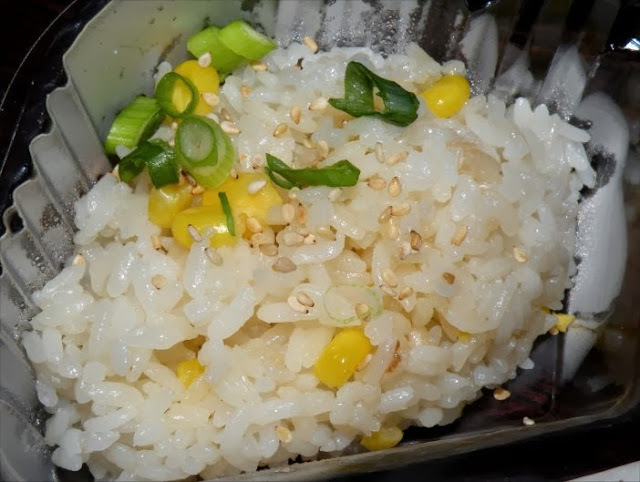 It had a bit of a taste of sesame oil, and although at first I thought the corn might be strange, it was a good texture contrast with the crunchy scallions. 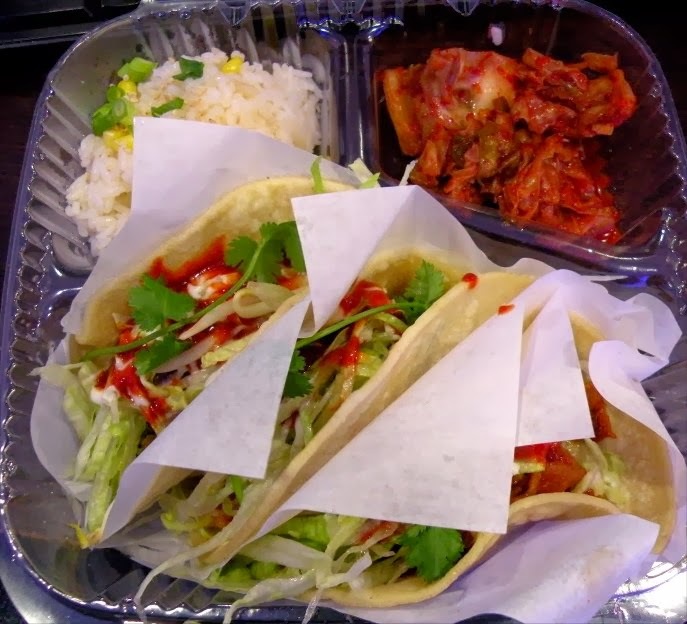 The tacos from Korean Twist were so good that while I was eating them I was already planning my return to the cart to get them again, or try something else. The meat in all three was exceptional, but the bulgogi was exceptionally delicious. 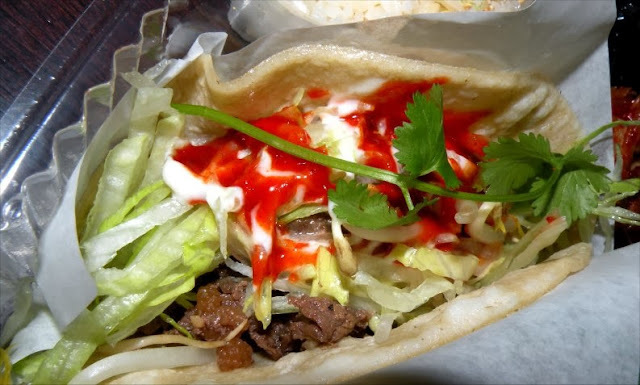 The super spicy sauce was a great contrast to the creamy "mayonnaise sauce", the crunchy bean sprouts and the delicate bite of cilantro. 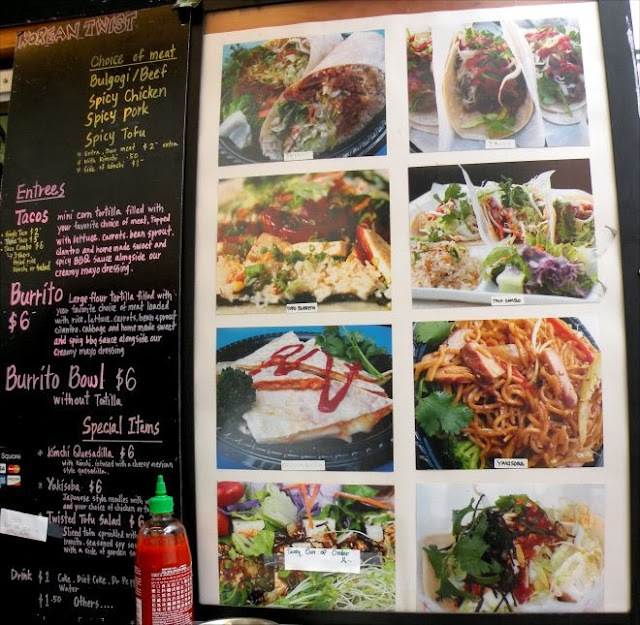 The day after I took these pictures I returned to Korean twist for a bulgogi burrito (no bean sprouts, add kimchi). It was as big as my head (and I have a HUGE head), and was just as delicious as the tacos. 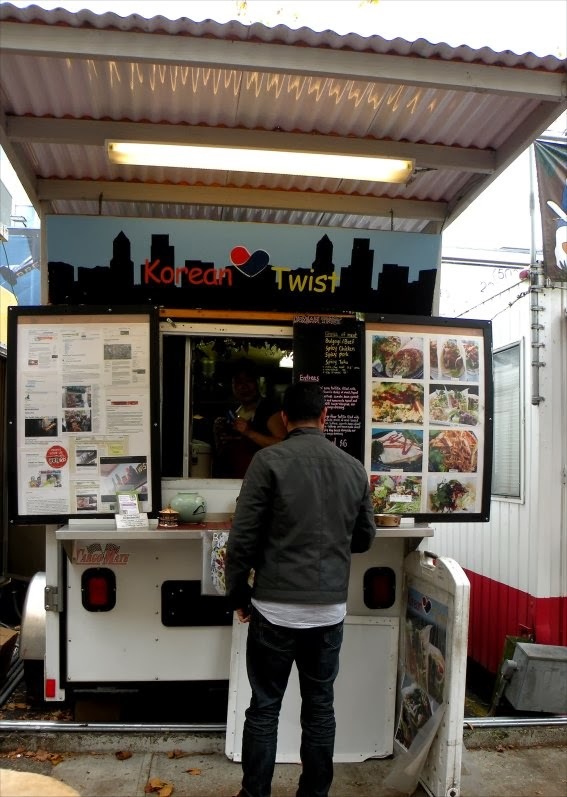 If you'd like to check out Korean Twist for yourself, their facebook page is here. 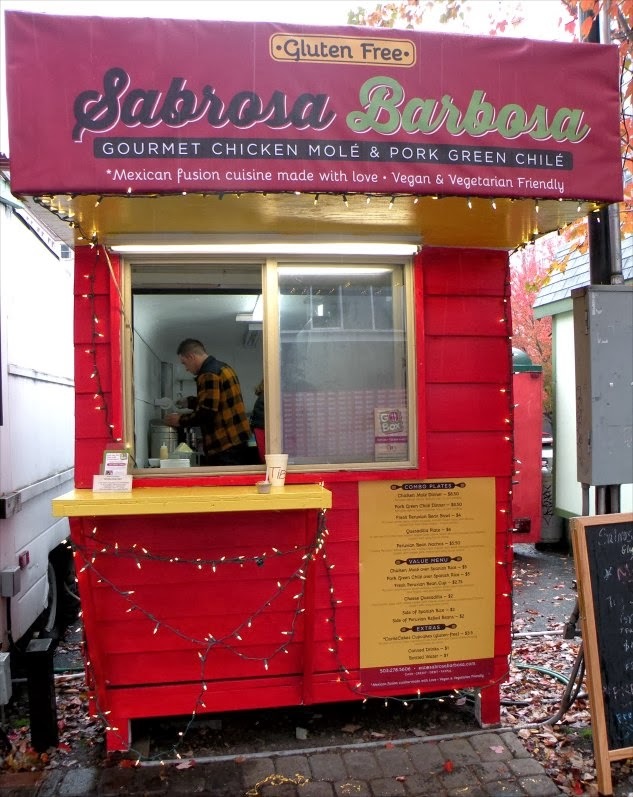 They are located at the food cart pod at the corner of SW 10th Ave and Alder Street in Portland. They are open Monday - Friday from 11:30am - 5:00pm.